More color in the kitchen - White cabinets will remain but expect more color. You will continue to see more blues and grays but also neutral wood tones replacing painted cabinets. Homeowners will be using color to help them personalize and make their kitchens unique. No more white or stainless steel sinks – Kitchens will be taking on more of an industrial look with more concrete, copper, and stone fixtures. Darker hues of gray, bronze or black will be a popular choice for kitchen sinks. Florals are making a comeback - You can expect oversized blooms with black white and gold contrasts. You might even see them in a wallpaper backsplash. Vintage lighting - This trend started to pick up last year. With brass coming back in early 2017. Copper and pendant lights will be a hot commodity. Deep wide sinks - Farmhouse sinks have been popular over the last few years. They will continue to rise in popularity as they are practical and easy for many in the kitchen to use. They are practical and look great! At Central Cabinetry, we are up to date on all the current trends. You can be confident you will get a unique kitchen that fits the needs and style of your family, but one that won’t go out of style anytime soon. If you would like to have a conversation with one of our kitchen experts about your upcoming Orlando kitchen remodel you can contact us here. 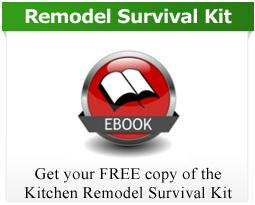 If you want to save money on a remodel, download our FREE budget busters guide.